Award-winning Pastry Chef Johnny Iuzzini celebrated his visit to snow-laden Chicago recently by mixing up a batch of Chocolate Snowballs from his second cookbook, Sugar Rush. Here’s the link to the video at NBC Chicago. For some reason the vid wouldn’t embed into my post. Anyway, if you’re looking for something to offer up for Valentine’s Day that’s chocolate and fairly quick with no baking involved, try throwing these together. You will need to allow 2 hours to let the dough set. What got my attention is that this recipe is a little different than the norm in that it doesn’t call for nuts or marshmallows but rather butter cookies, an odd choice I thought at the time. The butter cookies give it a different texture altogether. If you want to pass on using those, the recipe is a bit versatile because you could certainly use graham crackers instead of the butter cookies and substitute nuts for the coconut. 1. Put the butter, sugar, cocoa powder, and milk into a small saucepan and heat over medium-low heat, stirring occasionally, until the sugar is dissolved and the mixture is smooth. 2. Remove from the heat and stir in the espresso powder, vanilla, and salt. 3. Put the crumbs into a medium bowl and pour the warm liquid mixture over them; mix well until crumbs are evenly moistened. 4. Line a small sheet pan with parchment paper and spread the mixture out on it in an even, thin layer. Refrigerate for 1 to 2 hours. 5. Scoop level tablespoon-sized portions and roll them into balls. 6. 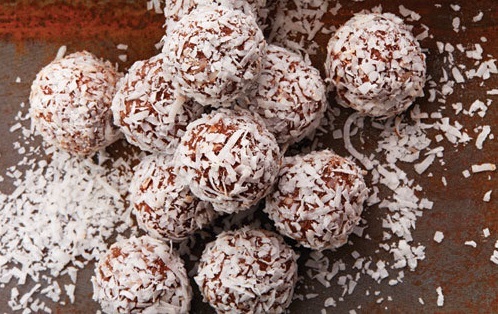 Toss them in the coconut, rolling firmly with your hands to adhere the coconut. 7. Refrigerate for at least 30 minutes before serving and up to 1 week.